30 Day Quick Start Challenge! So, here what I decided to do. I can’t un-learn 33 going on 34 years’ experience in commercial real estate sales what I can do is start over. What do I mean by that? I am going to start new in a new market and see what I can turn up in just 30 days. I am going to start from ground “zero” identify the market area, research the properties, find the owners, send out Secret Weapon Letters, do 1st Appointments, Proposals, and 2nd Appointments just like a new agent would. Additionally, I will do this all myself…no assistant, no mentee, or junior agent. I am also going to do this while juggling my duties as a commercial sales manager, husband, father, and professional dog walker. I am going to record all my successes, and failures and post all the results on my blog so if you want to follow along you can. I will keep track of the number of secret weapon letters I send out, how many calls I get, how many calls I make, the number of 1st appointments, proposals, 2nd appointments, and listings I get. I will also keep track of all the buyers I turn up and any transaction that I put together during that time. I will not include anything that has been “simmering” in the background or that I have a previous relationship with the owner. In other words, all of this is going to be “cold” right out of the market real deal transactions. I remove anything where my reputation is known so everything will be new, fresh, and above board. Also, to make the context relevant I am starting the “30 Day Quick Start Challenge” July 1, 2017 three days before the 4th of July which falls on a Tuesday this year. Stay tuned this is either going to be a huge success or a painful learning experience! A few months ago, I mentioned that I was going to be periodically reading and “rating” books that I thought other business people might find useful. In addition to the list I published a while ago (The Seven Books That Made Me Millions) I like to read books that I think are going to help me in my career. One of the most important things we do in commercial real estate sales and leasing is to negotiate. Whether you realize it or not you negotiate all the time. You negotiate with you kids, spouse, boss, and finally clients and customers. 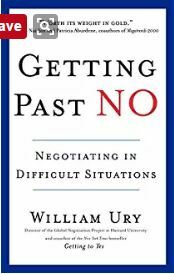 In “Getting Past NO” William Ury how you can create win-win situations in almost all negotiations. He goes on to explain how you can get far more accomplished in the negotiation process by simply making it a “collaborative” process instead of the old “winner-take-all” strategy of the past. He talks about the “5 Barriers to Cooperation” and they can derail a negotiation before it even gets started. He also makes suggestions about how to “stage” the negotiation process so that rather that an “us-versus-them” you can create an atmosphere of collaborative problem solving. Mr. Ury stresses the need to not let your emotions get the better of you and cause you to say or do things in a negotiation that create barriers to a successful conclusion. In his book Mr. Ury proposes a five step framework to break down barriers in the negotiation process. His first step he calls “go to the balcony”. Going to the balcony gives you the ability to look at the negotiations from a different perspective. He suggests that this simple step can help you suspend the emotions and allow to respond to the negotiations in a more rational fashion by staying focused on your goals. The second step in to recognize the other sides negative emotions, fears, or negativity and not to get involved in it. Your mission is to try to defuse their negative emotions so that you can sit side-by-side and attack the subject of the negotiations from problem solving prospective. Step three is to listen and attempt to understand the opposing party’s perspective and more, to understand their concerns in the negotiation. He goes on to say “Tell me more. Help me understand why you want that” He calls this step “Reframing”. Ury calls the fourth step “Building them a Golden Bridge”. In other words, create a solution that lets them solve the problem, save face, and have a victory. I have often said that in commercial real estate most Buyers and Sellers are more concerned with getting “their pound of flesh” than the about the actual deal itself. The fifth and final step is to use power to educate rather than punish. Ury explains how using power in a negotiation is a natural reaction to someone using coercive force against you. The problem with using that positional power is that it can backfire and cause the negotiations to grind to a screeching halt. Next…I will be reviewing Fanatical Prospecting by Jeb Blount. In the 1970’s Professor Burton G. Malkiel published “A Random Walk Down Wall Street” which promulgated his sleeping scale of investments (i.e. Stock, bonds, mutual funds, etc.) and correlated the amount of sleep one could get or lose based on their choices of investments. I have borrowed, “somewhat liberally” from his book and therefore give him full credit. A relatively new arrival on the scene is the DST (Formerly TIC’s) or Delaware Statutory Trust. Briefly, these are “syndications” that are put together to take advantage of the 1031 Tax Deferred exchange. One benefit of DST’s is they allow the buyer to purchase an asset that may have traditionally been out of reach for an individual investor. Most assets are managed by a “Sponsor” which usually has a good deal of their own money at risk as well as that of the investors. The downside is that there is no defined market for those who want to exit a DST so liquidity is an issue. Another issue is that there are two warring factions in the DST industry, the Real Estate variety which sells as a true deeded interest and a Security version that is sold as shares. Both are real estate based but the fees and loads can vary greatly. Next on our scale is the single tenant office/industrial property with regional or local credit. Unlike the large national companies the Tenant is not a national player and is therefore presumed to be of a lesser creditworthiness. This does not necessarily mean that they are less valuable as a tenant, it is simply an indicator of resources in the event of a default. There is no corporate headquarters to appeal too, and generally no prominent board of directors to embarrass publicly. The risk is what you see, is exactly what you get. Given the increase in risk associated with a regional or local Tenant you will see an increase in the yield required to entice investors. The only reason I put medical office buildings lower on my scale is due to the nature of that business (especially since Obama Care, and Trumps threatened repeal). Unlike warehouses most medical space requires a huge, and I do mean HUGE amount of build out. I have seen dental offices cost over $250/sq. ft. and that excludes wallpaper, paint, and all the other niceties. The good news is once you get ’em in, you can’t hardly get ’em out. Doctors and Dentist are loathe to move, unless it is absolutely necessary. The downside is that the space is highly specialized, doctors can be difficult tenants and can be demanding. Fully equipped and built out medical/dental space can be difficult to re-lease and the time on market can be exhausting. In my opinion Retail Centers are like college football, a whole lot of action and excitement and at any given time there can be a major upset. Retail centers are tied to retail sales, and retail sales are tied to disposable income and consumer attitude. If someone with authority like Janet Yellen (Ben Bernanke was in the early version) whispers the “R” word, consumer attitudes change overnight, bond traders throw themselves out their office windows and retail sales are off for the next quarter. Neighborhood and community centers are more susceptible than regional or super-regional malls because they are dealing with “man or woman on the street” kind of Tenants and generally not the big national Tenants. The challenge is the volatile nature of the retail business in general, think in terms of sit-down restaurants or hair and nail salons. How many seem to come and go on a weekly basis? Dead last on my list Multi-Family!! Unless you’ve been in a coma for the last three years you are probable aware that there is something of an oversupply of condominiums in the Tri-County market (Again and only 10 years later). Here is my prediction; they are not going to sell quickly! In fact, I’ll even go out on a limb and state, for the record that many will be put back on the market as rental units! You see, people bought these units’ “pre-construction” and knew, absolutely, positively, beyond a reasonable shadow of a doubt they could sell them for a much higher price later. Surprise, markets don’t always expand, prices don’t always rise, and there is not always a “greater fool” waiting to bail out a poor investment. As those units come back on the market they will compete with stock in the marketplace, thus driving down prices and driving up concessions. The only expansion in the Multi-Family market I see in the foreseeable future is in affordable units. The challenge there is finding land at a price point that will allow affordable housing developers an opportunity to make a profit. In conclusion, I think it’s time to get back to reality, transactions must cash flow, you can’t convert everything to condo’s, and there is not always someone out there who is willing to buy your mistakes at a premium. Invest in real estate, real estate with positive cash flows, long-term tenants, with the appropriate amount of leverage with a specific goal in mind. Always remember that the one constant in commercial investment real estate is that the market changes…it always does! You guys…asked for it…Monthly Business Book review! For about the last 25 years I have been reading at least a book a month if not a book a week. Invariably, I will come into the office and talk about what I just read, learned, or was amused by. The somebody says “Hey can I borrow that” and I’m guessing about 600 copies later I never see it again. So, what I have decided to do…is read the book, put up a cover, and tell you a little about the subject and how good…or not…it was. I may even sneak in a link to it on Amazon. I lieu of giving you a book review at this time I am going to give you a link to 7 of them…I call it the 7 Books that made me millions! Adam P. Von Romer, CCIM, Commercial Sales Manager with CENTURY 21 KoRes was nominated and has accepted a position on the CENTURY 21 Commercial Advisory Board (CAB). The advisory board is made up of 12 experienced commercial Brokers, Managers, and Agents from various regions around the country in order to give the Commercial Advisory Board a broader diversity of various levels of commercial real estate experience. Von Romer has more than 30 years of experience in real estate, specializing in the sale of industrial and office investment properties. Von Romer has been a real estate instructor, mortgage broker, mortgage broker instructor, and has obtained the CCIM designation and is a member of the National Association of Realtors and the Investment Real Estate Institute. About Century 21 KoRes: CENTURY 21 KoRes is a full service agency of real estate experts committed to you and your goals. KoRes principals Tulio Rodriguez and Monica Cataluna-Shand, and a dedicated team of talented agents, have the knowledge and skills required to make any real estate transaction, no matter how complex, a stress-free experience. For more information, please call 954.888.9946. The Top Five Personality Traits of a Successful Commercial Real Estate Agent! Over the last 20 years or so one of the questions I hear most often in a commercial real estate course is “what makes a good commercial real estate agent?” Now, that I have the luxury of being able to sit back and think about the question, I think I have an answer. I think there are five key traits that all the great commercial real estate agents I have known, taught, or done business with have. It doesn’t matter what they did in a prior “life” or what their educational background is. I think they all share the same characteristics. I have known guy’s right out of college that have done extremely well. I also have known people that were from fields so completely removed from commercial real estate that I couldn’t imagine them surviving let along excelling. I knew one character that was in the garment business, left the garment industry behind and became a very successful commercial real estate broker. This guy literally did everything the wrong way, he specialized in buyer brokerage; he had a secretary print his emails so he could read them, and his desktop computer was essentially a giant paperweight. Yet, somehow he managed to earn a six figure income every year! How did he do it despite violating just about every tenet of the real estate guru’s? Trait Number One; Perseverance, he was absolutely persistent…not pushy, but persistent. He had his own way of keeping track of people and following up with them. And boy did he follow up, see he understood that a “no” today didn’t mean a no forever or even next week. He would prioritize his leads into A, B, and C quality leads and then he would follow up. A’s got more attention than B’s and C’s because the A’s were the most likely to buy in the near term. B’s and C’s got contacted but less frequently and over a longer term. He knew that buyer’s required cultivation and he would just keep “watering” them every now and again and when they were ready to buy he was there to help. One of the other things he did that I thought was absolute genius was he never called a prospect without something new to offer them. He would always have a new bit of news or a recent transaction or anything that would add value to the conversation. Trait Number Two: Patience, one of the biggest mistakes I see new agents making is the mistake of trying to close something too fast. I know this is going to sound silly but allow me a war story! Seller: Yeah, I would sell that building…but I wouldn’t take a dime less than $2,500,000 for it. Me: Okay, well why don’t we get together and see if I can make that happen. Seller: Just bring me an offer. Me: Trying frantically to overcome that objection. Seller: Just bring me an offer and put in your fee. That is an oversimplification but that’s about how it went. The good news is that I had targeted that area because I had someone looking for that market. In fact the party that I was working for owned buildings in the area and wanted to add to his holdings. I spoke to that owner and he indicated that he would definitely buy a building like the one I had found, and he would not pay any more than $2,500,000 for such a building. Lights and sirens sounded in my head…I have a deal…Maybe! What would happen if I went charging over to the buyer’s office with a $2,500,000 offer an hour after we spoke? So, what did I do? I slowed the action down. I asked the buyer to put in an offer that was lower than the $2,500,000 that he would have paid. Why, because everyone in a real estate transaction wants to feel like they got a “deal”. The seller doesn’t want to leave money on the table and the buyer doesn’t want to overpay. I went back and forth between the buyer and the seller three or four times and got them both to agree to a price of $2,250,000 with a full commission to the broker. Both felt that they had gotten their “pound of flesh” and had gotten the full benefit of the transaction. Trait Number Three: Inquisitiveness, all of the most successful agents I know are naturally curious and are constantly looking into different ways to market, prospect, package, finance, sell or underwrite a transaction. That is why you will see all those initials after their names like CCIM, SIOR, MBA, CPA or any number of others. The top professionals keep learning and investigating they know you can never know all there is to know about a topic. I once read a report about a study of competence. In the study the subjects were interviewed and asked to rate their individual competence in a particular subject matter. The people conducting the study then provided and exhaustive test that specifically targeted the competency of the test subjects. What they found was revealing, the people who rated themselves as competent and scored poorly tended to overrate their competency buy as much as 60%. The people who were competent in the subject matter routinely underestimated their competence by as much as 20%. The results astounded the scientist conducting the experiment. They wanted to know why the huge disparity in people’s opinions about their level of competence. The answer was interesting, it seems that the people who were incompetent “didn’t know enough to know what they didn’t know” in the scientist words they lacked the metacognitive skills to recognize their incompetence. The take away is stay curious and interested, learn all you can about your product and then…learn some more! You must develop the habit of “doing the most productive thing you can at every business moment” and compartmentalizing your time. You should be at your desk at the latest 9 am and you should work until at least 5 pm. You may even take your work home, I try to do work wherever I am and make it fun. Sometimes I do proposals on the patio while enjoying a cigar, or I do research while watching a movie, I often take pictures on the weekends while listening to my favorite music. The point is you have a lot of work to do and a finite amount of time to do it so prioritize, organize, and maximize your efforts. Lastly, don’t get bogged down in the “office” stay away from the coffee machine or the water cooler and for heaven sakes don’t pay any attention to what anyone else is doing unless they are incredibly successful! Trait Number Five: Execution, you must have the ability to focus on the task at hand and see that task to completion. Too many people get caught up in doing what is urgent instead of what’s vital and they flip from project to project and never really get much accomplished. They are busy, but they never seem to get anything done or completed, they just go from project to project and never seem to quite get it in the “can”. You know the ones I am talking about they move pile “A” to position “B” and then start all over again. I understand that there are projects, proposal, marketing plans that are multi-part and require an ongoing effort. Here is the point break the projects down into discrete units of activity, set a specific time to complete that portion of the project and then move on to the next project. Later in this book we will discuss what a typical day would look like in the life of a newly minted commercial agent. Block off time to do your prospecting, proposals, first appointments, listing presentations and follow up and when you have met your specific target go home, go to the gym, read a book, make sure to schedule everything and see each item to completion. You can have a life and a career if you plan your business and execute that plan. Again, stay away from the “water cooler” crowd they will be able to tell you with great authority what doesn’t work…because they are currently doing it. I had a guy in my office that refused to adapt to the new market realities. I explained to him that sitting and waiting for buyers to walk into the office was meaningless and he could count on having nothing happen. I told him about the “secret weapon letters” and he completely rejected the idea as too silly to work. Finally after about two months he sent out about six total letters and waited for the phone to ring. After about another month he concluded that “secret weapon letters” didn’t work and after several years in the business he was moving on. that there is no substitute for hard work and dedication. In short the top commercial brokers I have worked with over the nearly 30 years I have been in the business all have those five personality traits, they all have the qualities of perseverance, patience, inquisitiveness. They are all disciplined and spend time working on transaction they know have a strong probability of closing they don’t get sucked into the vortex of office politics and any other nonproductive activities. They also all have a strong desire to execute, close a transaction and move on to the next. I hope that gives you some insight into the traits that make for a successful career in commercial real estate. Tune in nest week for some more insights into the different property types that make up the commercial real estate arena…I’ll give you a hint there are more ways to make money than you can probably imagine.